for the U.S. U-18 WNT in Mexico. Eclipse Select Soccer Club forward Zoe Redei (Highland Park, Ill.) was a lethal scoring machine for the U.S. U-18 Women's National Team over the past week. 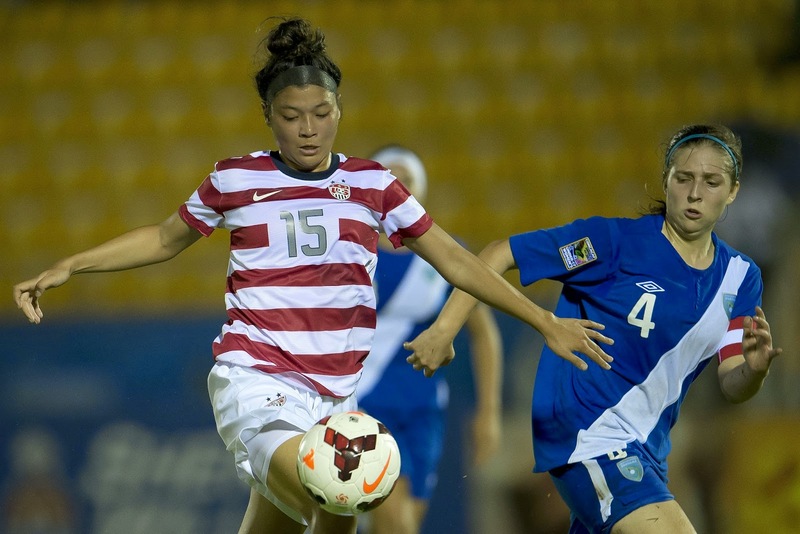 Redei scored all three of the USA's goals in a two-game set against Mexico's U-20 team in Mexico City. On July 25, with the USA trailing by a goal in the second half, Redei tallied a 56th-minute equalizer to help the U.S. U-18s earn a 1-1 draw. Then on July 27, Redei scored two second-half goals for a 2-0 USA victory. She notched the game's opening goal in the 48th minute and put the match away with an 89th-minute score. Eclipse Select Soccer Club is reaping heavy praise following a well-rounded 2014 Elite Clubs National League Finals at the U-16 and U-17 age groups. Four of Eclipse Select’s U-16 ECNL title-winning players were honored by Top Drawer Soccer on its ECNL Best XI of the tournament: U-16 goalkeeper Stephanie Rodriguez (Batavia, Ill.), defender Hannah Marwede (Lake Forest, Ill.) and midfielders Marissa Bosco (St. Charles, Ill.) and Alia Martin (Carmel, Ind.). 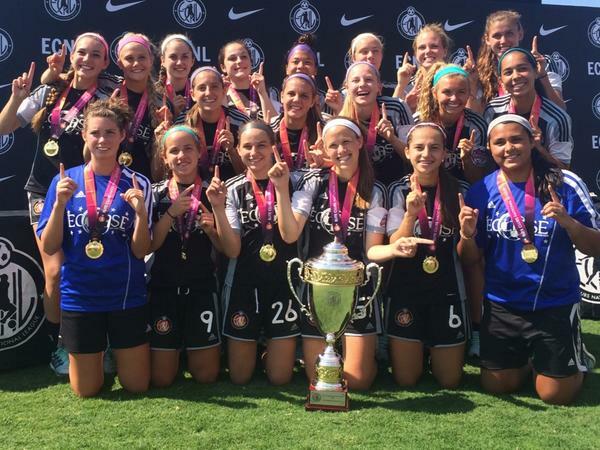 This age group enjoyed its second straight ECNL national title, following up Eclipse Select’s 2013 ECNL crown as U-15s. This year’s Eclipse Select U-17s earned second place in the nation, and three players were named to Top Drawer Soccer’s U-17 Best XI: midfielders Aspyn Repp (Lake Bluff, Ill.) and Chelsea Burns (Jacksonville, Fla.) and forward Maya Neal (Naperville, Ill.). For Top Drawer Soccer’s full synopsis of each Eclipse Select player, visit TopDrawerSoccer.com to check out their U-16 Best XI and U-17 Best XI. Eclipse Select Soccer Club’s two Elite Clubs National League teams had a stellar run at the 2013-14 ECNL National Finals in Richmond, Va. The event was highlighted by Eclipse Select’s U-16 group earning the national title with a 2-1 victory against the Dallas Texans last Thursday, marking back-to-back crowns for this age group. The Eclipse Select U-15s won the 2013 ECNL Final. Additionally at this year’s event, the Eclipse Select U-17s took second place in the country after posting a 2-0-1 record in group play. For the U-16s, the Lea Waddle (Lake Forest, Ill.) scored what proved to be the game-winning goal off of a Zoe Redei (Highland Park, Ill.) cross to take a 2-1 lead. Marissa Bosco (St. Charles, Ill.) added a first-time volley from 20 yards out to push the Eclipse Select lead to 3-1 in the 68th minute. Earlier in the game, Alia Martin (Carmel, Ind.) scored on a penalty kick in the 21st minute after Bosco had been taken down in the box. That gave Eclipse Select a 1-0 lead at the time. On Wednesday, Eclipse Select’s U-16s fell short to Players Development Academy, 2-1, but the squad had already qualified for the title match. For the U-17s on Thursday, Eclipse Select fell 1-0 to the Dallas Sting, but the runner-up finish did not dampen what was a great postseason performance for this group. Eclipse Select advanced to the final with a 1-0 victory against Players Development Academy last Wednesday. Chelsea Burns (Jacksonville, Fla.) scored the game’s only goal off of an Ann Marie Niro (Barrington, Ill.) assist. Redei Headed to U.S. U-18 WNT camp in Mexico: Fresh off Eclipse Select’s U-16 ECNL national championship, the busy soccer schedule for Eclipse Select forward Zoe Redei (Highland Park, Ill.) continues this week. She was named to the U.S. U-18 Women’s National Team for a camp that runs July 22-28 in Mexico City. The U-18 roster, led by April Heinrichs, includes 20 players. 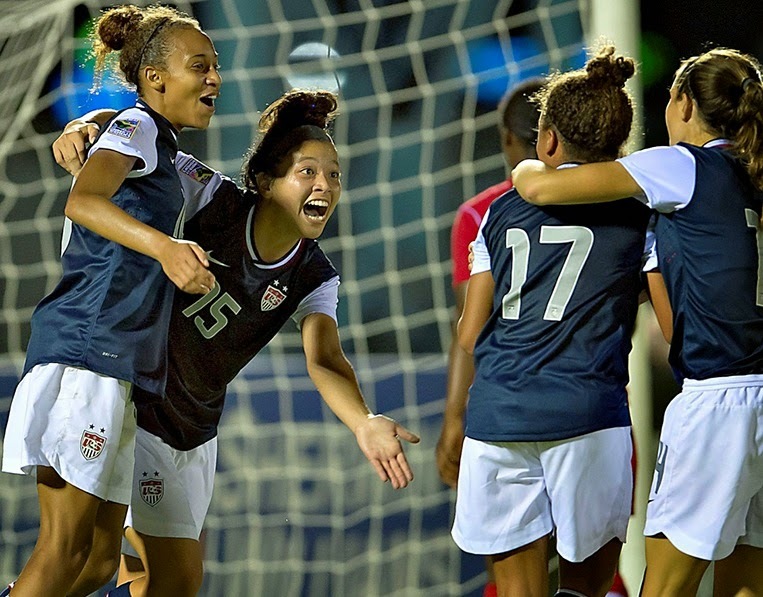 This marks Redei’s third national team call-up this year after starring for the U.S. U-17 during the 2013 CONCACAF Women’s U-17 Championship with five goals (tied for the team lead with Mallory Pugh). U.S. U-20 MNT defender and recent Club Tijuana signing John Requejo chatted with me during the 2014 National Training Center Invitational to talk about his role at left back, while Tab Ramos also praised his attacking prowess from the back. Eclipse Select's Jenna Lundgren (Elmhurst, Ill.) and Camryn Biegalski (Lombard, Ill.) of the U-15 Elite Clubs National League squad recently spoke with My Suburban Life's Dan Santaromita following their 2013-14 season. "It's the highest level you can play in club," said Biegalski, who will be a junior at Glenbard East in the fall. "There's a lot more pressure because you want to do well," Lundgren said. "You want to do better than last time and it's really nerve wrecking. It's really exciting to play because the fact that you got there is amazing." For the full story, visit MySuburbanLife.com. CHICAGO -- Eclipse Select Soccer Club is proud to announce a partnership with non-profit Pass It On, Inc., a scholarship foundation that provides youth athletes with the opportunity to compete in club soccer despite his or her family's financial hardships. Along with the partnership, Eclipse Select is also hosting a walkathon during its annual kick-off event on Sunday, Aug. 17, in Oak Brook, Ill., to raise funds for Pass It On that will go toward giving local youth players the chance to play for Eclipse Select. Since our formation as a club in 1995, it has always been of great importance to give back to those without the means to afford such an experience," Eclipse Select President Rory Dames said. "The opportunity to play soccer and interact with our community-driven club has been worthwhile for everyone who has been involved with Eclipse Select, so it's important and it's also a privilege to reach out to those aspiring youth players through scholarships and fundraising efforts. We are excited about forming this partnership." LA Galaxy U-17/18 forward Jaime Villarreal, who was a recent call-up to the U.S. Under-20 Men's National Team, spoke with me about the impact he has at the club level after representing the USA stage. I also chatted with his head coach, former Chicago Fire great Ante Razov, as well as Villarreal's Galaxy teammate Christian Chavez. Eclipse Select Soccer Club’s U-16 and U-17 teams will take to the national stage in Richmond, Va., when they compete in the Elite Clubs National League’s national finals. The two sides won their respective groups this past week at 60-Acre Park in Redmond, Wash.
Eclipse Select is among a group of eight teams that will compete in the ECNL Champions League at their respective age groups. The tournament draw takes place on July 12, followed by games on July 13, 14, 15 and 17. Eclipse Select has certainly had its share of ECNL success, specifically this season with the U-16 group, which earned the U-15 national title in 2013. Last year’s Eclipse Select U-23s also won the national crown, and Eclipse Select’s 2010-11 ECNL season included the Overall Club National Champion accolade. 2014 ECNL National Finals: July 12-17 in Richmond, Va.
For the latest Eclipse Select news, visit EclipseSelect.org. For Elite Clubs National League news, visit EliteClubsNationalLeague.com.